This DCM2.2 is a 2 megapixel digital camera that connects directly to your computer via the USB 2.0 port. With the included basic capture and measure software for PC, MAC, or Linux you can view, capture and make measurements of images directly from your microscope. 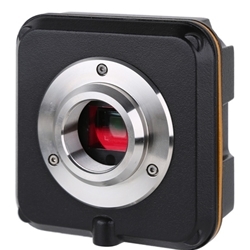 This digital camera mounts to a C-Mount adapter on the trinocular port of your microscope. Connects via USB 2.0 port to computer, c-mount threads to your existing c-mount adapter. Captures images up to 1600x1200. Captures motion video at 18 frames per second (fps) @ 800x600, 8fps @ 1600x1200. Includes basic capture and measure software. Digital camera has a 1/3.2" CMOS pickup device. View complete DCM 2.1 data sheet here.